We had a packed weekend. Whew! It was so nice to have time with family, though. I hope you all had a great Easter. Thank you for your helpful comments on Saturday's post. You got the wheels turning for me. I don't have a Mommy School project to share today, but I did squeeze in a little time to make a new header. I wanted to switch it up a little for spring. Plus, I got my boys to wear their bow ties to church yesterday and since they were all dressed up I figured it would be great to get a fun picture. Here's a bigger picture of the one I used in the header. Since Google Reader is going to die in July I just made the switch to Bloglovin. I've heard people say they love it, so I'm trying it out. I also added a button (just after the followers button) that allows you to subscribe easily to my blog through bloglovin. Since anyone in the reader will have to make a switch I thought it might make it a little easier. It also imports all your google reader blogs for you when you sign up, which made me super happy because I sure didn't want to have to try and type them all in. I have some fun t-shirts the boys and I made to show you tomorrow. Cute! Feel free to delete this, but I was curious if you meant to switch to "here" instead of "hear" in your header. Oh, you're right! I think I put the finishing touches on the header when I was half asleep :) Whoops! I'll definitely have to fix that. Thanks for the heads up! CHERI!!!! Omg love that pic!! Adorable!! I've switched to Feedly from Google Reader. Love it so far. Love the new header! This picture is toooooo crazy cute! Seriously! I cant get over it! Love the new look! That picture is soooo cute! You and your little men. And you little girlie to be! Eee! I switched over to feedly because it was the one that was recommended to me. I'm on it right now, I just discovered a 'preview' button on it that opens a little window like a pop up of the blog including the header and comment section, and on the top of it there's still the 'save for later' 'open in new tab' 'close' buttons. I think I'm in love with it, the iphone app is nice too. Kind of glad google reader is going down b/c the feedly is much faster to navigate than the google and google next while still managing to easily pull up the blog page. I tested both Bloglovin and Feedly - ended up choosing Feedly as the transition was minimal. I found with BlogLovin I have to go to the blog to even read part of the post versus Feedly I can read most in the ready except truncated content. Plus, Bloglovin wouldn't pick up content if my company's firewall blocked the site but feedly does. Love your new header and that picture is so adorable Cheri! The picture is darling and I love the new colors. sweet! Thanks for the tip about bloglovin! I was/am super bugged google reader is going away. Now I can chill out about it. Thanks!! too cute. 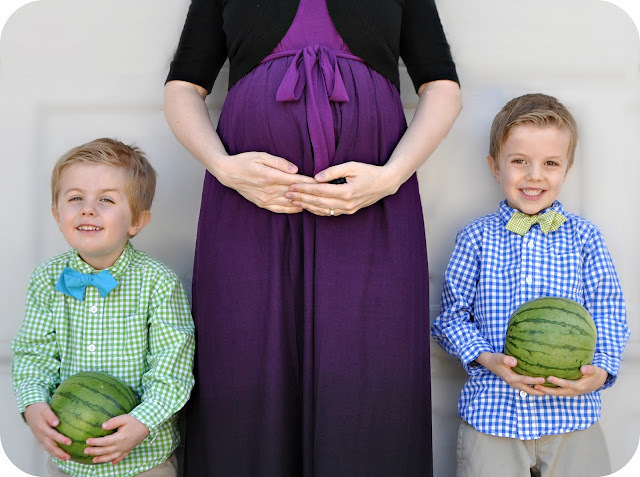 everyone holding their watermelon is so clever..
Love the picture!! So cute.. Where did you get that cute purple dress? I am pregnant as well and would love one like that!! Love your blog. I have two little boys and am hoping for a girl this time as well. I got the dress at Target a few weeks ago. I'm pretty sure it's still there. Good luck! I know you have an iPad - what blog app do you use on that piece of technology?